Includes seven rings with diamonds ranging from 30 pts to 1 ct.
Each and every handpicked stone is of G+ Color and VS+ Clarity. Shapes can be selected from five different cuts: Emerald, Asscher, Radiant, Cushion and Round. Each ring comes in a platinum mounting. To display your ARAZI Eternity rings, a luxury, high quality presentation display will be provided suitable for window or showcase. At Level Three, 7% is given when matched on retailers side. We also provide access to downloadable materials for print advertising. 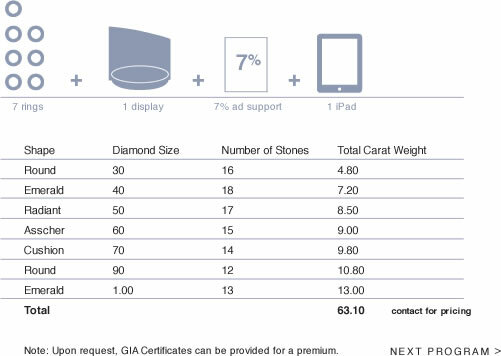 At this level, you will receive three complimentary Apple iPads so that you and your sales professionals will have instant access to a virtual portfolio of ARAZI’s Eternity rings in emeralds, sapphires and rubies at the tap of a finger.